Join this healing retreat on the Zambezi river for a transformational week of regeneration and reconnection with oneself, immersed in the peace and solitude of nature, benefiting from the powerful combination of therapeutic energy balancing massage, Tibetan Healing Yoga (Lu Jong), guided meditation, silence and the beauty of wildlife. The deep tissue massage is a unique combination of Chinese, Tibetan, Ayurvedic and Raynor Naturopathic techniques which identify and remove energy blockages, helping restore balance to the body, mind and spirit. Tibetan Healing Yoga will take place every day at sunrise, followed by morning meditation and meditation by candlelight after dinner in the cool of the night. Dining and excursions will be social times and on the river guests will have the opportunity to enjoy the extremely rich birdlife unique to the Zambezi valley as well as of course elephant, hippo and possibly other wildlife. Being a completely wild environment, there are no guarantees as to what you might see and hear, although the Valley is full of almost all species of African wildlife. You are immersed in nature and it is a fully spontaneous and magical environment with no enclosures, however as a result guests are not permitted to leave the property unescorted or by foot and should be aware and observant at all times. A completely unique experience with profound benefits to your health – physical, mental and spiritual. A typical day begins at 7am with sunrise yoga and meditation for 2 hours, looking out over the Zambezi valley, followed by a relaxed and hearty breakfast at 9am. Between either 10-12pm or 2-4pm each guest will receive a profound and healing massage daily. When not receiving a treatment, guests are asked during these two periods to observe silence and use the time for relaxation or reflection, in their rooms, in the garden or by the pool. Lunch is served between 12.30 and 2pm and at 4.30pm guests can enjoy the daily boat ride along the river to appreciate the wildlife and the scenery, returning to the house around 6.30pm after sunset. Set high on the crest of the hills, west of the Mana Pools National Park, looking down over the great Zambezi river and its flood plains, a rustic house with basic but clean and comfortable amenities, where simplicity is key and the magic of wildlife is around you. Meditate to the sound of the hippo, a wealth of birdlife, the occasional elephant wandering past. Additional afternoon boat trips to view wildlife can be organised upon request and guests can enjoy evening sundowners on the banks of the river, or else lie by the pool and simply merge with nature. Truly a week in the wilderness, perfect for yoga, treatments, meditation and a complete disconnect with the rest of the world. Rooms will be allocated upon reservation on a first-come first-served basis. Dominique Caubel is of Franco-Indian descent and was born in 1963 in the Comoro islands off the coast of Mozambique and to the west of Madagascar. At 8 years old he began to learn a variety of martial arts attaining black belts (Chinese and French) in both Kung Fu and Tai Chi. At 40, he began to specialise in “internal” martial arts without the focus on aggression and now dedicates his time to Tai Chi (Chinese) and Lu Jong (Tibetan) which he feels have similar visions. Dominique is a professional Lu Jong instructor trained and certified by the renowned Tibetan master, Tulku Lobsang. 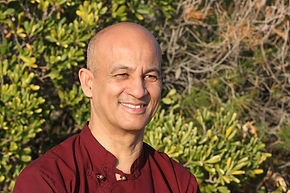 Through his physical practice, he discovered techniques for body treatment and studied Ayurvedic massage, Chinese medicine and Tibetan Osteopathy, combining his massage skills with Reiki (Master) and Karuna, to achieve an extremely powerful and unique form of healing massage. His massages are available to guests upon request subject to availability (see Treatments menu).